As always, VOAH organized a special gathering, which was beautifully catered by Troya Credo, a local business that organized similar events for the females throughout Vanadzor. Troya Credo provided appetizers for the guests and the 25 tatiks of VOAH, who had received new haircuts and make-up earlier that day. Members of the “Vanadzor Theatre of Song” group, led by the Artistic Director Gagik Aghababyan, participated in the event and honored the elders with their beautiful songs and performances. “For many elders, VOAH has become a real home which assembles all family members and guests on special events, and festivities like the one we’ve had today. International Women’s Day is another holiday for our tatiks to feel more loved and appreciated. This is a good chance in terms of diversification of the residents’ activities to have a change from their daily routine,” mentioned Manush Ohanyan – VOAH Executive Director. 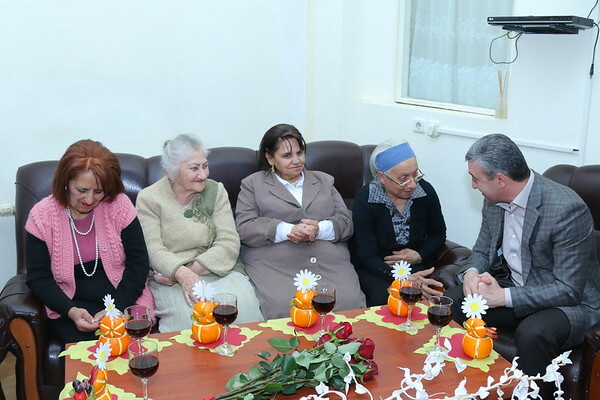 Besides the fourchette party, the residents also received special gifts from Artur Nalbandyan – personal cards and photo cameras. Everyone was in high spirits and very jolly moods for the celebration. The event was broadcasted on Lori’s “Fortuna” TV channel on March 8. Within the framework of the FAR Armenia, the sponsorship of VOAH has been carried out by the Kevork and Sirvart Karamanuk Foundation. The foundation is also supportive of many active charitable programs in Armenia as well as educational institutions in Turkey.